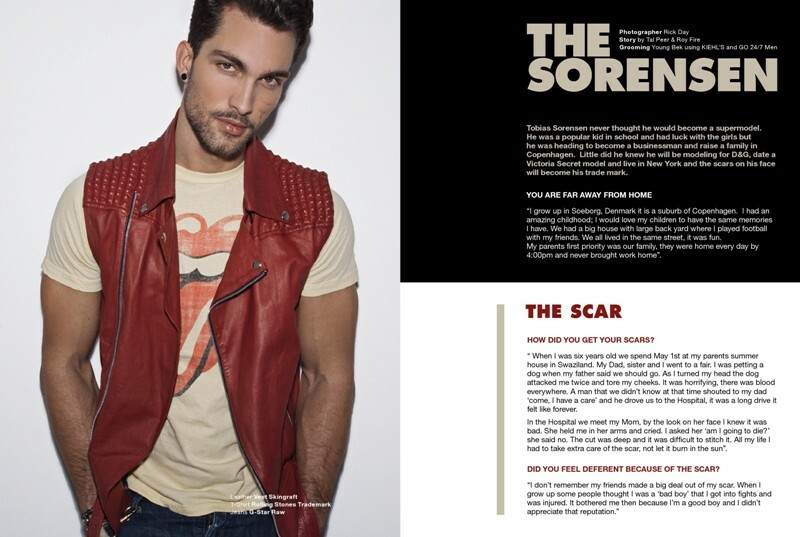 Tobias Sorensen never thought he will become a supermodel. He was a popular kid in school and had luck with the girls but he was heading to become a business man and raise a family in Copenhagen. Little did he knew he will be modeling for D&G, date a Victoria Secret model and live in N.Y and the scars on his face will become his trade mark. "I grow up in Soeborg, Denmark it is a suburb of Copenhagen. I had an amazing childhood, I would love my children to have the same memories I have. We had a big house with large back yard where I played football with my friends. We all lived in the same street, it was fun. My parents first priority was our family, they were home every day by 4:00pm and never brought work home". How did you get your scars ?
" When I was six years old we spend May First at my parents summer house in Swaziland. My Dad, my sister and I went to a fair. I was petting a dog when my Dad said we should go and I turned my head as the dog attacked me twice and tore my cheeks. It was horrible, there was blood everywhere. A man that we didn't know at that time shouted to my dad 'come, I have a care' and he drove us to the Hospital, it was a long drive it felt like forever. In the Hospital we meet my Mom, by the look on her face I knew it was bad. She held me in her arms and cried. I asked her 'am I going to die?' she said no. The cut was deep and it was difficult to stitch it. All my life I had to take extra care of the scar, not let it burn in the sun". Did you feel deferent because of the scar ? "I don't remember my friends made a big deal out of my scar. When I grow up some people thought I was a 'bad boy', that I got into fights and was injured. It bothered me then because I'm a good boy and I didn't appreciate that reputation. "The scar became my trade mark. Some clients Photoshop it but I don't care. I'm proud and humble to read that I inspire people because I have a scar and I work in the fashion industry. I want to help and let people know that beauty can be many things and there is beauty in imperfection".
" I went to college to study business and worked at Sixty Group' a clothing shop. I had the time of my life working at that store. One day a man came in and started to talk to me, he end up buying a jacket only so we can talk. He was working at Elite Modeling Agency in Denmark. He gave me his business card and asked me to call. I didn't like business school so I look at it as an opportunity and gave him a call". What was your first experience as a model? "A few weeks later I flew to Paris to do the Kriss Van Assche Fashion Show. He designs for Dior but he also has his own line. I was 19 with no experience, first time in Paris, I was in shock. I sat behind the scene of the fashion show dressed in that expensive outfit, the music started to play and for the first time of my life I was nerves". How did you know what to do in the show?
" In Paris I sheared an Hotel room with an experienced model who explained to me how do walk the runway, we watched fashion shows on T.V and practice so when I came to casting I was ready. At my first two seasons in Paris I didn't work allot but my third season in Milan was the breakthrough. I did fifteen shows. It was great but then came the resection". How did you end up in N.Y?
" Lana from VNY did casting at Hotel Principe Di Savoia in Milano. They looked at my book and contacted my mother agency, Elite, ask to represent me in N.Y.
First I came to N.Y to do fashion week. I lived in a models apartment, it was crazy, we slept two models in the same room, there were no windows in my bedroom. The other models never cleaned it was so dirty. I stayed for two month and went back to Copenhagen". When were you ready for the big move to N.Y?
" That's a little complicated" Sorensen laughs " I came back a few months later to the same models apartment. We were a bunch of young man looking to have some fun. There were allot of drinking and partying. One day Lana heard that we were partying all night and it affected our work. Lana came to the model's apartment to tell us we are a big disappointment to her, that the purpose of our stay in N.Y is to work not to party and we should think what we want to do in life. She kicked us all out of the models apartment back to our countries. Where you mad at her? "At the beginning yes. I didn't think it was my fault. After I came back to Copenhagen and did some thinking I realized she was right. She reacted like a mother, trying to make us grow up and take our business serially. I came back to N.Y a few month later a new man. I was ready to work hard for my career".
" When I moved to N.Y I lost some friends, I had to learn new language. For the first time in my life I lived all alone. I had to go though stuff to understand who I'm and what I want to do with my life". You have a unique style, how did you come out with it? "I decided I will not be that boring kid with the jeans and T shirt. You know, man can have style too. There are so many things to spice up your look. "I love hats, sunglasses I just love Tom Ford and Ray ban, May 14. I'm obsessed with Nike snickers, limited edition. I collect jewelry, I love Enirque Murthvan. My style is Eclectic I can wear sporty look and I can wear leather. I change it all the time". What do you do to maintain your body ? "For many years I did P-98. I didn't go to the gym. It is the perfect way to stay in shape when you're travelling. I was in the best shape of my life. Now I go to the gym five days a week for two hours and combine cardio and weights".
" 90's, Hip Hop. My favorite D.J is Morten Breum".
" I love Tai, sushi and Italian food. I also love to cook but I'm to lazy. I try not to drink so much".
" I love to stay at home and watch movies with my girlfriend (Jasmine Tookes a Victoria Secret model), to play gulf, play with my dog name and my Jasmine's dog".
" I miss my family, my mom and sister are in Copenhagen. I miss my dad who died a few month ago, he was my best friend".